"Feel like a regular the moment you walk through the door. 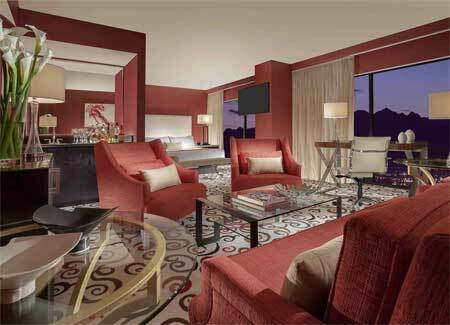 The brand new Downtown Grand Las Vegas redefines what a hotel & casino should be. 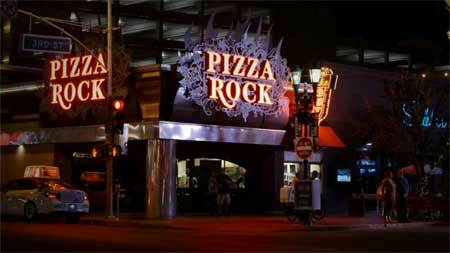 Unique restaurant and bar options delight every taste. Stylish hotel rooms feature an upgraded sleeping experience, modern amenities and comfortable furnishings. The industrial chic casino features brand new slot machines and all your favorite table games in a high-energy and intimate environment. Located in the center of downtown Las Vegas, Downtown Grand is steps away from the Fremont Street Experience, The Mob Museum, Fremont East Entertainment District, the Las Vegas Premium Outlets and many more must-see sights." "Downtown Grand Las Vegas is a part of the Downtown3rd community. Referred to as the new metropolitan center of Downtown Las Vegas, dt3 is at the heart of all of the best downtown has to offer. It’s a neighborhood for everyone. It’s a place to meet, by chance or by plan, to explore the latest foodie hotspots, live music venues, one-of-a-kind shops, and year-round fun of this creative and adventurous city. Downtown Grand is just a short walk to the charming eateries and bars of East Fremont, the edgy and quirky Arts District with it’s must-see First Fridays, the iconic Fremont Street Experience, the world-class Mob Museum and the awe-inspiring Smith Center with its incredible lineup of arts and entertainment. Whether you are a return visitor or a newcomer, there’s always something new to discover in our uniquely fun, raucous, hip and endearing Downtown Las Vegas." Downtown Grand Las Vegas offers complimentary valet parking for all hotel guests and $12 flat rate without validation for non hotel guests. Downtown Grand Las Vegas offers complimentary self-parking with validation. The self-parking garage is located on Ogden Ave. between 3rd Street and 4th Street. Downtown Grand Las Vegas has a workout facility. Entrance is free of charge for hotel guests. Refrigerators and roll away beds are available upon request. There is a $15 per night fee for each. "Three distinct towers, each with a different feel. Based on the creative vision of Philippe Starck in collaboration with Gensler and SLS Hotels, The World, Lux and Story Towers feature over 1,600 guest rooms, including more than 250 urbane suites. "Enjoy contemporary warmth, comfort and style in the World Tower, take a sleek and seductive retreat in the ambient Lux Tower, or experience the Story Tower, for those interested in high design and luxury. No matter which tower you choose, your stay at SLS ensures a Las Vegas getaway"
"This stylish and comfortable 350 square-foot room offers one king or two queen beds with presidential pillowtop mattresses and luxurious bedding. 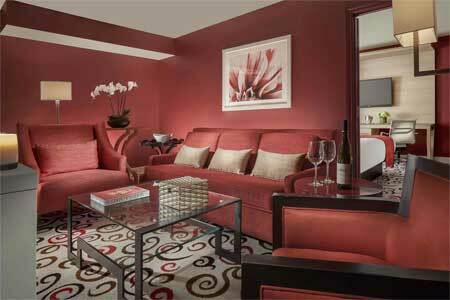 A 40-inch high-definition flat-screen TV provides a variety of entertainment options and property information. Standard and USB power outlets are conveniently located on bedside tables and on the built-in desk. Contemporary bathrooms feature a shower/tub or shower with environmentally-friendly amenities. High-speed wireless internet, bottled water, morning coffee and a Grand Experience Book featuring a variety of discount and complimentary offers from Downtown Grand Las Vegas, Downtown3rd and many of our selected neighbors are all included as part of the daily Grand Experience." This one-bedroom, 680 square-foot room features a king bed in a separate sleeping area with presidential pillowtop mattresses and luxurious bedding. Entertain guests in the comfortable living room while enjoying the 46-inch high-definition flat-screen TV provides a variety of entertainment options and property information. One-Bedroom Suites feature two contemporary full baths with showers and upgraded environmentally-friendly amenities. 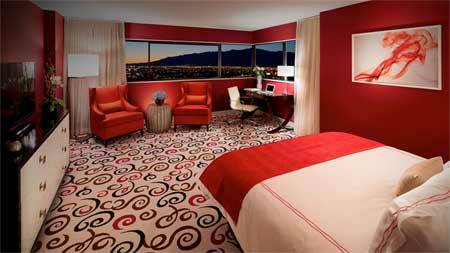 High-speed wireless internet, bottled water and coupons featuring a variety of discount and complimentary offers from the Downtown Grand Las Vegas. "Overlook the mountains and the city lights below of Vegas from the comfort of a luxurious penthouse suite. Room rates starting at $125. 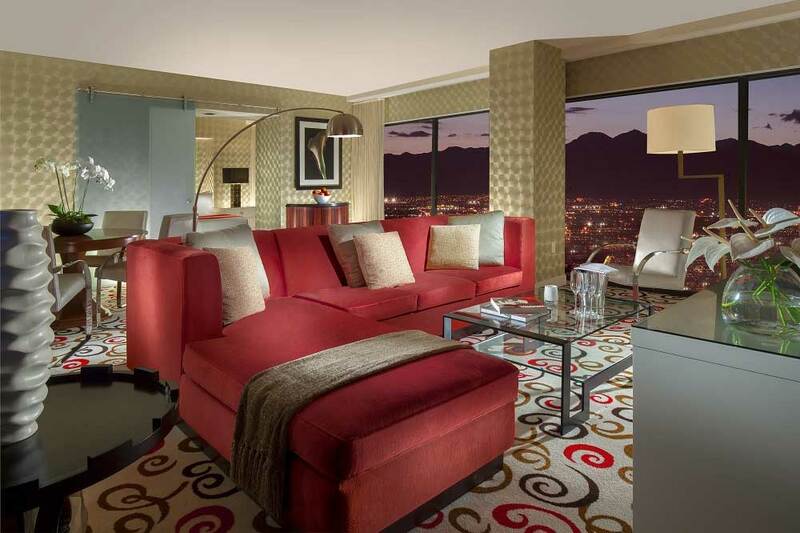 Top-floor, 720 square-foot room Floor-to-ceiling windows Expansive city and mountain views One king bed 46-inch high-definition flat-screen TV Expanded bathroom with separate vanity area Environmentally-friendly"
Enjoy the comfort of 4 full size beds plus 2 bathrooms! 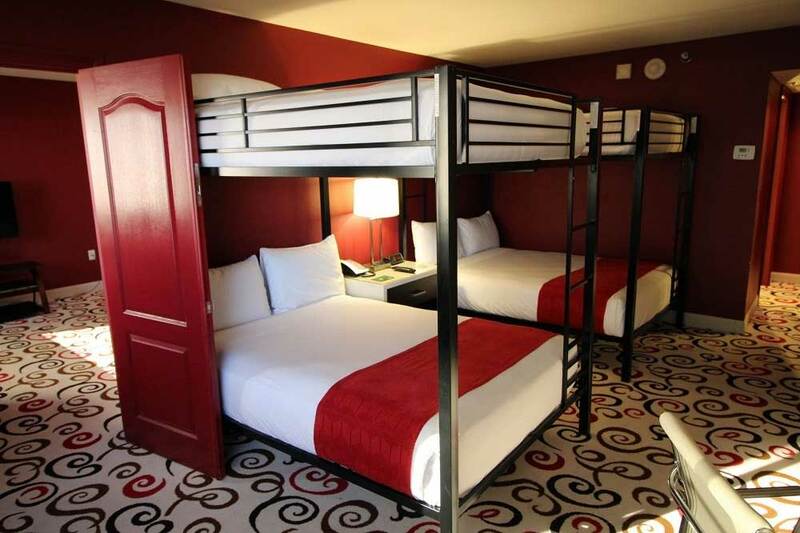 Room rates starting at $115. The Downtown Grand Las Vegas does not have a Buffet. Visit the LVBC's Buffet Page to find a good Buffet close by. The Golden Nugget or The Main Street Station are always a good choice. Are you the life of the party? Do you find yourself asking, “What would Frank do?” Do you know your scotch and bourbon and how to make the perfect Old Fashioned? If so, you might be a George. 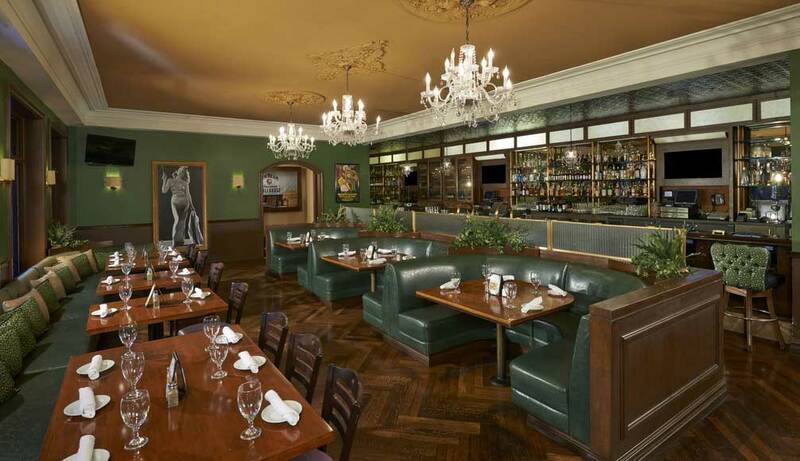 Whether you’re looking for the perfect kick-start to a night full of fun, or perhaps just a smart, upscale dining experience in the heart of downtown, Triple George Grill’s timeless atmosphere has the right mix. SOMETIMES IT’S THE FOOD. SOMETIMES IT’S THE MUSIC. SOMETIMES IT’S THE FREEDOM TO CHOOSE. As if playing the perfect hand, Freedom Beat answers the desire for an experience that caters to a new generation of food and music lovers expected from a Downtown Las Vegas restaurant. Conceptualized by 34th Floor Hospitality Group and designed by Bunnyfish Studio with a menu created by Chef Scott Commings (Hell’s Kitchen Season 12 Champion), Freedom Beat’s menu takes its diners on a culinary road trip – from Madison, Wisconsin to Austin, Texas to the Rocky Mountains of Colorado to America’s heartland. Freedom Beat also has a yin for its yang; live musical performances, bringing two halves of something great together. Created as both a dining destination and an intimate, state-of-the-art performance venue, Freedom Beat transforms itself with the crash (or splash) of the first cymbal. Casually-fun and approachable, Citrus Grand Pool Deck is always free for hotel guests, visitors and locals alike. Enjoy a refreshing and relaxing day splashing around or lounging poolside and experience an amplified pool party under the starry skies at night. While enjoying the outdoor oasis, poolside dining and cocktails are a must. The menu at Citrus (created by Chef Scott Commings – Season 12 winner of Hell’s Kitchen) offers an array of perfect poolside fare including Brick Fired Lavosh Flatbreads, Jicama & Feta Salad, Hummus & Grilled Pita, Street Tacos and Pineapple Soft Serve. Following a meal shared with friends, it’s time to sip on a refreshing signature cocktail like the Recovery Lemonade and Passion Punch, or try one of our Frozen Cocktails including Pina Colada, Margarita and Hurricane. Latin Kitchen by Richard Sandoval is a unique dining experience from the internationally acclaimed chef who has positioned three different cuisine concepts, all within the same eatery. The space features reclaimed wood, high back leather chairs, and a 140-seat patio for enjoying the heart of downtown Las Vegas. Art Bar, where the featured collection of works by local artists is as authentic, eclectic, and vibrant as the surrounding Downtown Las Vegas environment. Your intention may be to grab a quick drink or a small bite, but don’t be surprised if you end up late for your dinner reservation. From the overstuffed chairs, to the mini-exhibits you’ll want to explore, to the interactive social buzz you’ll feel from the moment you walk in, Art Bar beckons you to stay just a little bit longer..
CITRUS AT THE GRAND POOLLounge in, on, or beside the only casino top pool in DOWNTOWN Las Vegas. Hogs & Heifers Saloon is an All-American, Classic/Outlaw Country and Southern Rock Dive Bar where the Bartenders interact with the crowd, sometimes via bullhorns, as they sling drinks, share laughs and generally throw the best damn party in Vegas! We know velvet ropes and snooty bouncers aren’t for everybody. Enter Furnace, our version of the casino bar where you can drink and delight in your lively surroundings. Furnace may even FEEL like a nightclub – with its high-energy vibe, crystal chandeliers, and pleasing staff. But make no mistake– just steps from the action on the casino floor, this industrial-chic focal point proves you can be “cool” without the cover. 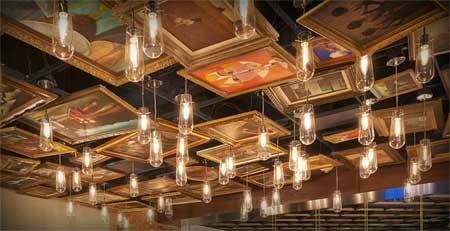 "A reclaimed factory space with an industrial chic vibe, Downtown Grand’s casino gives its patrons an open and unique gaming environment to get on the perfect lucky streak. Whether your goal is to win big at our brand new slot machines, live it up at the tables, or get down to business with sports wagering at The Spread, you’ll find our full-service Downtown Las Vegas casino and exceptional staff more than accommodating." 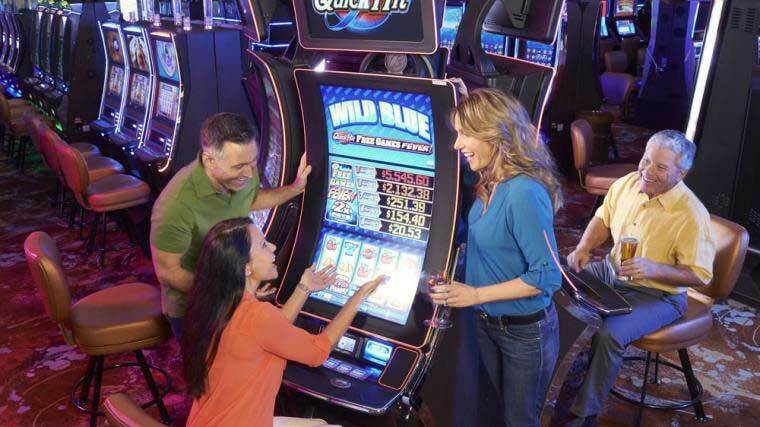 Try your luck with over 500 slot machines including updated classic titles such as Quick Hits, Buffalo and Hot Roll, to the newest favorites including Batman®, The Flintstones®, The Big Bang Theory® and Buffalo Stampede. Where every seat in the house can become a hot seat during our daily floor promotions. "Come. Sit. Play. You might be surprised to discover not just games, but also a welcoming social scene in our “network” of nearly 30 tables. 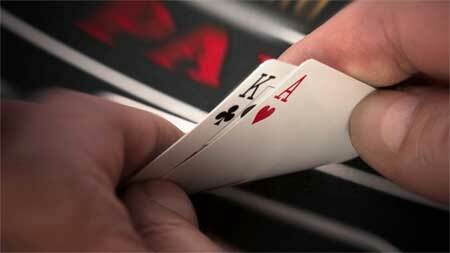 Try your hand at any one of the following games: Blackjack, Craps, Roulette, Pai Gow Poker, 3-Card Poker, Big 6 and more!"